September 15 - October 15 is National Hispanic Heritage Month. During this period, people recognize the contributions of Hispanic and Latino Americans to the US, and celebrate their heritage and culture. September 15 is important as the beginning of this observation, as it marks the anniversary of independence of 5 Latin American Countries: Costa Rica, El Salvador, Guatemala, Honduras and Nicaragua. Mexico celebrates its independence days on September 16, Chilie on September 18. The Hispanic/Latino contributions to American society can be found in all aspects of life: literature and journalism, music, theater and film, sports, business, technology, and government, to name a few. And Hispanics and Latinos have served in the US military in every major military conflict from the American Revolution on up to this day. For these reasons, we at Viridian Gold are proud to carry Hispanic style jewelry. 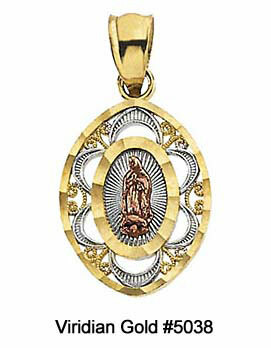 See, for example, Our Lady of Guadalupe jewelry. Our Lady of Guadalupe, known as Nuestra Senora de Guadalupe, is the Patroness of Mexico and the Continental Americas, and is an important part of the faith of Hispanics and Latinos. 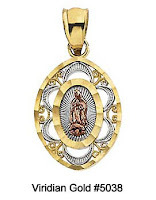 We are please to offer medals, pendants, earrings and rings of the Virgin Mary, such as Our Lady of Guadalupe Marquise Pendant #5038, a customer favorite, and Our Lady of Guadalupe Tri-Color Oval Ring #1407. See also our Primera Comunion Pendiente #5512 (Our Lady of Guadalupe First Holy Communion Pendant) for Hispanic and Latino young ladies. We also carry a selection of Religious Lockets, as well as Quinceanera Jewelry ~ rings, pendants, lockets and more, for La Fiesta Quinceanera, such as our Sterling Silver "Mis Quince" Locket #5719. Crucifix and coss pendants for both men and women are popular items, for example, our Hispanic-style Floral Cross Pendant #5522, available in 14K yellow, white or rose gold, and our Large Sterling Silver Cross Pendant #5266. 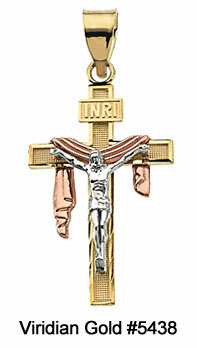 Our Gold Crucifix with Shroud #5438, a customer favorite, is designed from 14K tri-color gold with a yellow gold cross, a white gold corpus and a rose gold shroud. For further browsing, see our Crucifix Pendants and our Cross Pendants. If you still have not found that special jewelry item you are searching for, check back with us, as we are constantly adding new items to our website. Or better yet, give us a call and we will do our best to help you with your search. And to all our customers of Hispanic descent, we thank you for shopping with us!